Whether they grow up to be athletes, dancers or everyday people with busy lives, children need a variety of movement experiences to develop their potential for health and performance in later life. With the changes in the amount and type of activity that children are exposed to in their daily lives, there are corresponding changes in physical ability and physical health being seen in children of school age. Balance, posture, coordination and joint stability are just a few of the areas which can affect a child’s health or their ability to explore a range of physical opportunities. Some children are not exposed to enough movement stimuli. Others start to develop early injuries as a result of over training in a single sport. For optimal development, give a child the opportunity for variety. Learning to throw and kick a ball, learning to climb, to fall without hurting themselves, to roll and jump and stretch and balance …. these experiences all contribute to the physical capability of the child. Variety helps to reduce excessive stress on specific areas in the body, and can help to prevent imbalances. Helping a child to move well is giving them a gift for life. Keep an eye open for forthcoming resources on child development from JEMS®. Taking a ball of any size in the hands, the child stands on one leg. With the knee slightly bent, they start to bounce the ball from hand to hand. 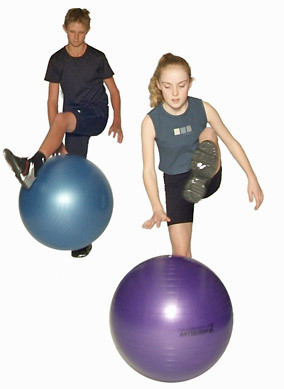 If they can keep their balance, they can start to bounce the ball further out in front of them, allowing their knee to bend and their body to tip forward with a straight back. Bounce it back in and try bouncing it out to each side. Then can they bounce it under one leg and keep their balance?